I’ve written before about Queen’s Pose, the supported restorative version of reclined baddha konasana, and this is one of my favorite before bed poses to do, especially when pregnant. But there is one other pose that I love doing before bed because it relaxes the mind and body so quickly and simultaneously opens the hips and back setting you up for restful sleep: Supported child’s pose. Forward folds naturally relax the central nervous system and when they’re supported the results are two-fold. By placing a bolster on the floor in front of you and spreading your knees a part, making sure your toes are touching, you rest one cheek on the bolster and breathe deeply. After you’re ready to switch sides, gently support yourself with your hands, elbows bent, and turn your other cheek to rest on the bolster. (Pic coming soon to demonstrate). If one bolster is not enough height to support you comfortably, you can place an additional bolster on top or a yoga blanket or two. When practicing this pose while pregnant make room for your belly comfortably at the foot of your bolster, do not rest on your belly. You want your belly to hang freely and have space to open and the breath to expand naturally without constriction. 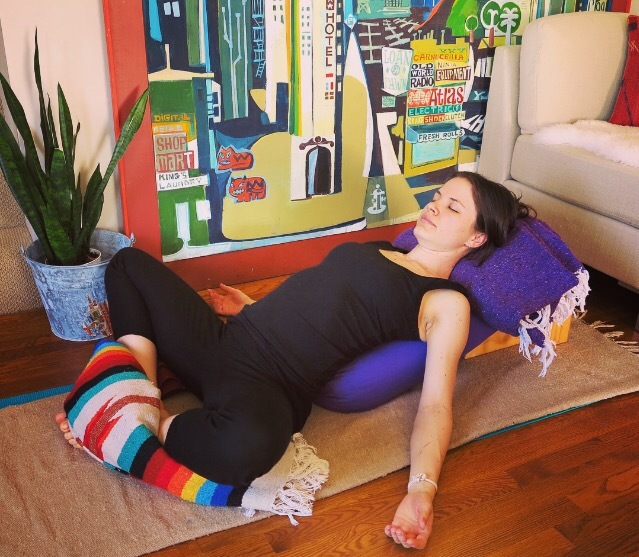 These restorative poses are wonderful birth prep as they open the hips, guide you towards the mind-body connection you’re looking to cultivate during labor and help you get the much-needed rest you need before giving birth and taking care of yourself and your little one. 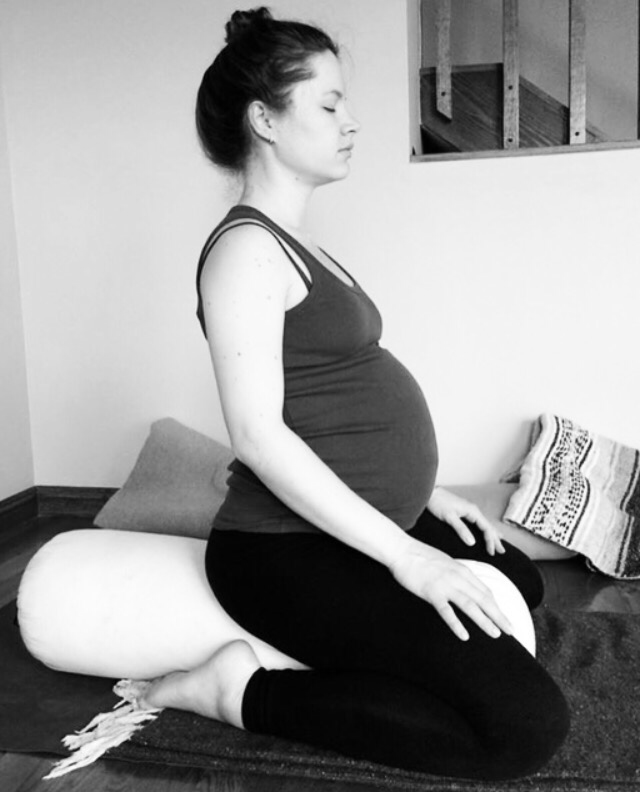 Today I looked back on a peaceful moment preparing for the upcoming birth of my little one in a photo of me in supported Virasana towards the end of my pregnancy. This is one of my favorite poses. It’s wonderful for quiet meditation, setting the day’s intention, reflecting and recollecting– both mentally and physically. It helped me stay centered and in tune with myself as I prepared for the hard work that was to come in labor and in childbirth. During my pregnancy it was the starting point for my daily home practice. Enabling me to connect with myself and my growing baby it served as a place for checking in with myself and baby and a safe place to start moving mindfully through the poses that followed. I remember a wonderful teacher of mine in San Francisco, Nina Gold, who would have us sit in Virasana with eyes closed as she guided our mediation. She instructed us to move the flesh of our bottoms from our sit bones and “sit down there more.” In some of her classes I would try to follow along and struggle a bit. Other times I was able to feel my sitbones and “sit down there more.” On those days I felt the profound grounding and calming effect the pose and her words had on me. I was not only sitting with my body but with a calm mind. I was able to simply be in those moments. I felt like I had the whole world beneath me offering me support. And in a great sense I did. I am particularly fond of Nina and her teaching style because I find her to be so precise. She would catch me doing silly things (like letting my floating ribs jet out in standing poses or over-extending my elbows in downward dog) that other teachers would let slide or simply not notice. That is the beauty of Iyengar yoga. It is very precise in its origins. Open a copy of Light on Yoga and you will see what I mean. Detailed descriptions of how to get into each pose, the benefits and a photograph of the master himself demonstrating lend a beautiful picture into the embodiment of yoga that is the late B.K.S. Iyengar. When he passed away in 2014 it was around the time this photo was taken. I was in a class led by another great teacher, Larry Lopez. I remember feeling the warm tears running down my cheeks unable to hold back as Larry led the incantation, voice cracking, releasing tears himself. A dedicated student of Iyengar’s, Larry had been traveling to India for many years to study under the great master. Larry has his own studio and school for Iyengar yoga, Bija Yoga, in the Inner Sunset district of San Francisco. I cried that day because I was struck by the realization that I would never be able to study under Iyengar myself but also because of the sheer love and dedication I felt from my teacher and fellow students in the classroom. Iyengar yoga has had a profound effect on my life since it was introduced to me and this moment reminded me just how pure that influence really is.